I created a Holiday card using a few stamps and dies from Hero Arts. I love to stamp backgrounds, so naturally I had to stamp a background for this card. I used a small wreath image from the Lia’s House set and stamped it using Fields Green ink. I mounted my stamp onto a clear block with grid lines and used that grid to help align everything and create a pattern. You can also make a grid using a pencil and a ruler if you don’t have clear blocks with grid lines. Next I stamped a heart using Royal Red ink inside some of the images to diversify this background. 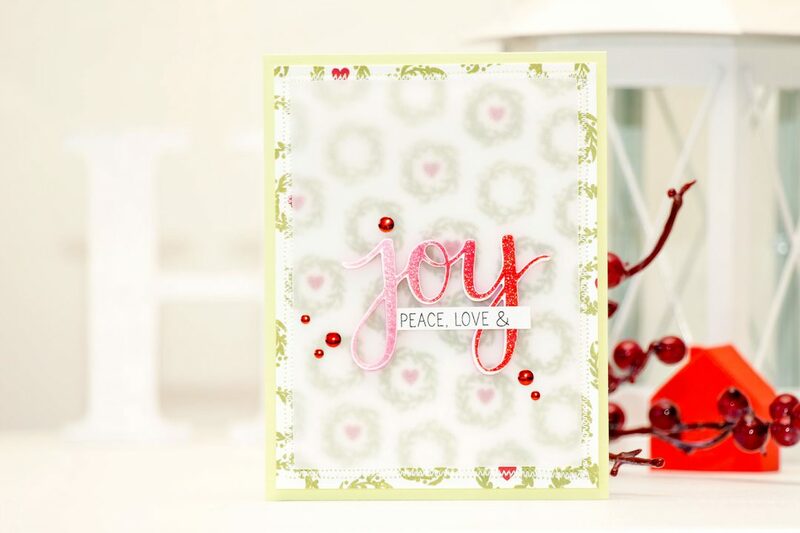 The Joy sentiment was first cut out using a Joy die, stamped using Pink to Red ombre ink and than heat embossed using Sparkle embossing powder. I foam mounted it onto a panel cut out of vellum using fun foam and adhesive sheets. I also used a few red metallic dots to dress my vellum panel and adhered it onto the stamped background which was later adhered onto a light green Hero Arts card base. absolutely gorgeous…love the background stamping and the glitz! Very pretty card. You have a jump on your holiday cards. Oh, I love this! The vellum is so pretty and the card just has a frosty goodness that I like! Gorgeous card! So elegant and festive!!! This is gorgeous! I adore your stamped background! Well done!!! Thank you for your lovely card idea Yana. 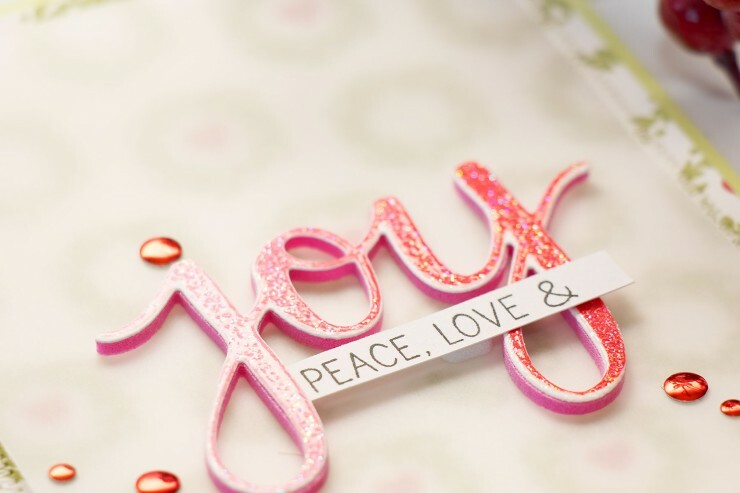 I just wanted to confirm something, did you cut a piece of adhesive sheet and stick it onto a piece of fun foam and then die cut the word Joy? And was it just one layer of fun foam to achieve that thickness?